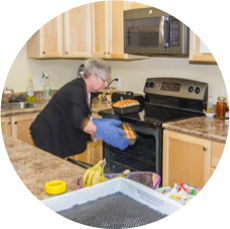 Hospice House, a 10 bed residential hospice located in downtown Fredericton provides 24 hour care to palliative patients and their families. Care is offered by a specialized team of nurses, support staff and physicians in a home like, caring environment. Through physician referral, patients can be admitted to the home from their homes or hospital. 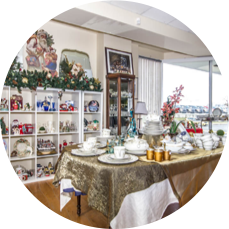 Hospice House also provides rentable rooms for families who find travel difficult during this time. Admission to Hospice House is on a voluntary basis and patients can be admitted directly from home or transferred from hospital. Patients must be registered in the palliative program to be eligible for inpatient care within Hospice House. It is the palliative physician that determines if a patient is eligible for admission. Following receipt of a referral, our admissions team will work closely with the patient, family and medical partners (such as Extra Mural) to ensure a smooth transition to the facility at the appropriate time. For more information please feel free to contact us. The adult day centre offers programming for individuals with mild to moderate cognitive and/or physical impairments. The J.T. Clark Family Centre is open 9am to 3pm and offers a safe, caring, nurturing environment. Clients are provided with structured day programming, lunch, snacks and many varied activities. The program offers support and respite to families in order to keep loved ones at home. Please contact us for referral and registration information. In-home support: home visitation program delivered by trained volunteers who provide emotional support to both patient and family. Care for the caregiver – volunteers are available to provide relief care to allow families to take a break. Narrative care – the Narrative Care program helps direct the focus into the patient’s lives by identifying the joyful times. Narrative volunteers will help patients to re-tell the story of their lives and share their memories with loved ones. Grief Support – Hospice offers a 6 week grief support group. This group is facilitated by two experienced social workers and is both supportive and educational. Hospice Fredericton is pleased to offer educational opportunities for professionals providing palliative care in the long-term care setting. LEAP – Learning Essential Approaches to Palliative Care is an interactive two-day course. Offered twice yearly at Hospice House, Pallium Canada’s LEAP Long Term Care offers inter- professional clinicians competency-based palliative care education specific to the Long- Term Care setting. Topics covered include: being aware, taking ownership, pain management, GI symptoms, hydration & nutrition, essential conversations, respiratory symptoms, grief, decision making & advance care planning, last days and hours, psychosocial/spiritual care and delirium/dementia. Please visit www.pallium.ca for further information on Leap certification.